The Rt. Rev. 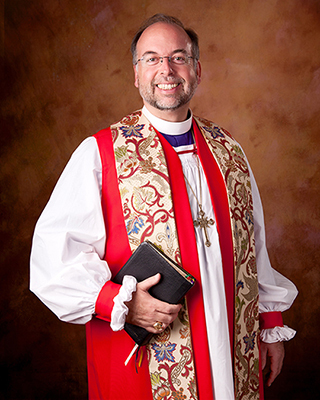 Jeff W. Fisher serves as the regional bishop of the Eastern Region of the Diocese. He was elected bishop suffragan and consecrated in 2012. In addition to his visitations to parishes and missions, Bishop Fisher serves as executive for pastoral ministries, including clergy and their families. He serves on numerous boards and institutions, including the Episcopal Church Women, Daughters of the King, Altar Guild, the Small Church Network, All Saints' Episcopal School in Tyler, St. Vincent's House in Galveston and St. James House, the diocesan retirement community in Baytown. Bishop Fisher is known for his compelling preaching, his focus on evangelism and his encouragement of the laity. He teaches homiletics at the Iona School for Ministry. A graduate of The University of Texas, Austin, Bishop Fisher was previously CFO for Hand Benefits & Trust, Inc., Houston. He received a Master in Divinity in 2004 and was awarded a Doctor of Divinity in 2013, both from Virginia Theological Seminary. Ordained in 2004, Bishop Fisher served as curate at St. Mary's, Cypress, before being called as rector at St. Alban's, Waco, where he ushered in a time of unprecedented growth. Bishop Fisher and his wife Susan have two adult sons, Scott and John. El Rvdmo. Jeff W. Fisher es el Obispo regional de la Región Este de la Diócesis. Fue elegido Obispo Sufragáneo y consagrado en 2012. Además de sus visitas a parroquias y misiones, el Obispo Fisher sirve como ejecutivo de ministerios pastorales, incluyendo el clero y sus familias. Sirve en numerosos consejos e instituciones, incluyendo las Mujeres de la Iglesia Episcopal, las Hijas del Rey, el Gremio del Altar, el “Small Church Network”, la Escuela Episcopal de Todos los Santos en Tyler, la Casa de San Vicente en Galveston y la Casa de San Santiago, la comunidad jubilada de la diócesis en Baytown. El Obispo Fisher es conocido por su predicaciones, su enfoque en la evangelización y su ánimo hacia los laicos. Enseña homilética en la Escuela de Ministerio de Iona. El Obispo Fisher se graduó de la Universidad de Texas, Austin y anteriormente fue director de finanzas de la compañía Hand Benefits & Trust, Inc., Houston. Recibió una Maestría en Divinidad en 2004 y fue galardonado con un Doctorado en Divinidad en 2013, ambos del Seminario Teológico de Virginia. Al ser ordenado en 2004, el Obispo Fisher sirvió como cura en Santa María, Cypress, antes de ser llamado como rector en San Albán, Waco, donde marcó el comienzo de un período de crecimiento sin precedentes. El Obispo Fisher y su esposa Susan tienen dos hijos, Scott y John.